I first heard about Darktable software in 2016 and actually was quite fascinated with the name itself. Within a few hours of hearing about it, I went to the official Darktable website and downloaded it on my Linux machine. Have been using it for quite a while now alongside Adobe Lightroom Classic CC and hence decided to write this small review post. If you are looking for a free Adobe Lightroom alternative, this might be or might not be for you depending on what you need. Darktable is a free open source post-processing software which can do non-destructive RAW photo editing and photo management. Non-destructive means it does not change the original RAW file, all the edits are written to a sidecar file. It has evolved through so many phases of bug fixing and operating system compatibility. The latest version is available for Linux, MacOS, and Windows. Being an open source software it doesn't surprise me that it is available in 21 language translations. That's the power of open source! Let's talk about a few insights about Darktable and where does it stand in comparison to Lightroom Classic CC. -Lighttable: This can be considered as the equivalent of library module in Lightroom Classic CC. It includes rating, import options, tags, keywords, and thumbnail settings. -Darkroom: I am sure film photography folks are quite familiar with this word already. This mode is the brain of Darktable, where all the post-processing takes place. Correct white balance, adjust exposure, etc. In addition to Darkroom and Lighttable, it has got Tethering, Map, Slideshow, and Print mode as well. Let's dive into the topic of looking at good and bad sides of Darktable. 1) Great masking: Darktable has built-in mask options under every module. You can play around with masks to edit brightness, contrast, and hue in a specific part of the image. Further three options for masks are drawn masks, parametric marks, and drawn+parametric masks. Example: An outdoor soccer field match photo where sunlight is too harsh on one part of grass field but there is a hockey player on it. 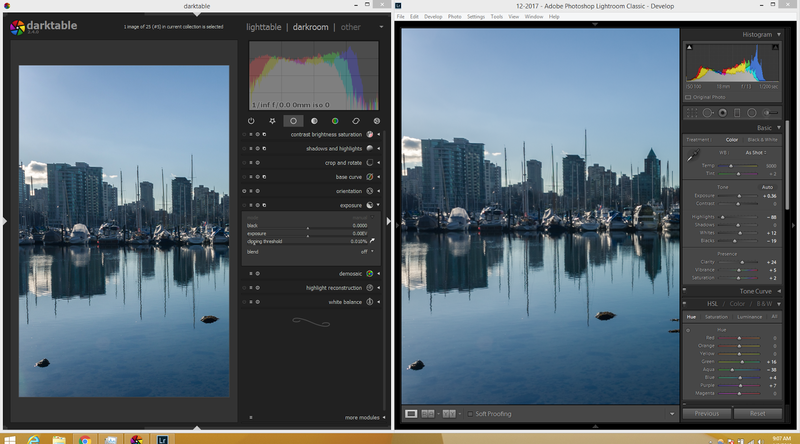 This situation is tricky and cannot be resolved with simple brushing that we have in Lightroom. This can be achieved by parametric masks which would decrease the high luminosity for us. Select a reference point -> Overlay -> Adjust with slider. This will select only that area. 2) Really cool path tool to select a square, circular shaped objects for better brushing. 3) Decent availability of keyboard shortcuts: L for Lighttable, D for Darkroom, M for Maps, S for Slideshow as an example. 4) Equalizer module: Equalizer and Denoise come under the correction group. The equalizer has luma (brightness of image), coma (image colour) and sharpness as three further options. The bar to edit stretches from coarse to fine and smooth to noisy. 5) Multiple instances of filters. 1)The file management and digital asset part could love some improvements. If you can manage your own photo folders and ordering files, then sure Darktable is good. 2)Steep learning curve. Darktable will give you barebone options, like 3 sliders for the same one slider in Lightroom. Do not expect to be able to edit images in a flash just because you made the switch. Take it slow and browse forums about specific questions whenever you get stuck. Once you get a grip on your own workflow, it will get a lot better. 3)Lightroom and Darkroom edits are not 1:1, so you will lose edits and other changes when making switching between Lightroom to Darktable. 4) Correction of lens profile for a given photo. These profiles are handled by the lensfun library. Linux users can work around it by installing liblensfun-bin package. This way the lensfun DB gets updated. In conclusion, Darktable is a solid open source software for photo editing if you can tolerate the little hiccups. People always love to criticize these open source projects but keep in mind they are made by a really small group of people who do this stuff in their spare time. Of course, it cannot compete with high-end retouching offered by GIMP and Adobe Photoshop. Hope this post helped you learn more about Darktable. If you enjoyed the post, share the photography love by sharing this post.